While oven is heating, mix together your whiskey with 1 cup brown sugar and cayenne pepper in a small saucepan over medium/high heat. Stir to combine. Bring to a boil and then reduce to a simmer for 10 minutes. Remove from heat and set aside. Brush the bacon with the whiskey reduction and then sprinkle with remaining 1/4 cup brown sugar. When ready to make your grilled cheese, heat a large skillet over medium high heat. Butter the outside of each slice of bread. Sprinkle each buttered side with a pinch of garlic powder. Place each slice of bread onto the hot skillet, butter side down. 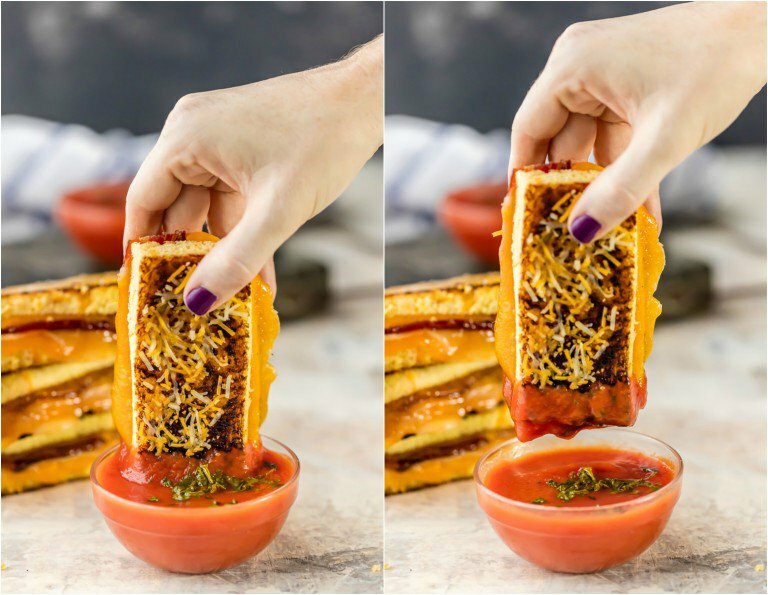 Add one slice of cheddar and one slice of mozzarella to each slice of bread and allow to melt while bread toasts. Cook each slice of bread for approximately 2 minutes, or until the outside is fully toasted and browned to your liking. Cut each sandwich in half, between the bacon, to create 8 dippers.